Capsule Summary: After Colonel Potter puts the kibosh on his attempt to redecorate his office, Klinger decides to go AWOL. Meanwhile, Hawkeye calls Sidney Freedman to help treat a suicidal war hero. I like both of the storylines in this episode but not necessarily the balance between them. A little too much time is spent on Klinger’s storyline (which I suppose makes it the A story) which doesn’t leave much room to develop the Sergeant Michael Yee storyline. That’s too bad, because it’s something that deserves more attention. Off the top of my head, I can’t think of any other episodes that touched upon the issue of Asian soldiers in the U.S. Army and their feelings about fighting North Korean and Chinese soldiers. South Koreans fighting North Koreans, to the point of brother fighting against brother, came up once or twice (in “Communication Breakdown,” for example). The mystery of why a decorated soldier like Sgt. Yee would attempt suicide unravels once Sidney talks to him. He fought in Europe during World War II. It wasn’t until Korea that he had to point a gun at an Asian enemy. The guilt ate him up inside so he volunteered for the most dangerous missions, hoping to get himself killed. The episode ends on a seemingly positive note for Sgt. Yee but I can’t help but worry about him. After being hypnotized, Yee thinks it’s been just five since Sidney came over. He learns from Nurse Kellye that two hours have passed. There’s a brief shot of his face as he digests this information. It almost makes me wonder if Yee realized something happened to him. Hopefully the hypnotic suggestion that he twitch his hand rather than try to kill himself sticks. 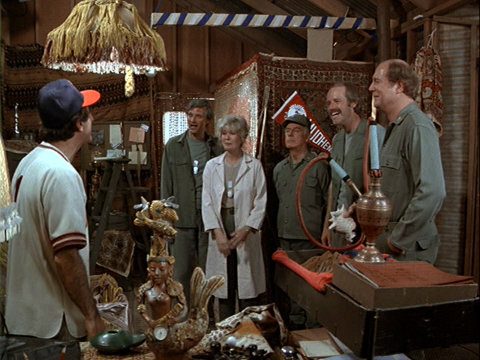 That brings us back to Klinger and his wacky decorations. They’re over-the-top, obviously, as are the reactions from Hawkeye, B.J., Margaret and Charles. Even if they’re joking, the comments they make are hurtful and almost out-of-character, except perhaps for Charles. Even when Hawkeye and B.J. try to apologize, they’re still making fun of Klinger. But it’s all necessary to push Klinger to the breaking point so he’ll attempt to forge the discharge papers required to get him home. His plan to transform into Sven Lundgren works. Or at least the first step of the plan–outsmarting the entire United States government–works. Poor Klinger has to race to I Corps and impersonate Radar in order to get the discharge papers back. Somehow, that crazy scheme works out, too. Klinger defends his redecorated office. Most sources indicate the title of this episode is “Goodbye, Cruel World” but it’s spelled “Good-Bye, Cruel World” on DVD. Colonel Potter references a DuMont television set. DuMont both manufactured TV sets and operated a television network. The network folded in 1956 and is mostly forgotten today. When defending his decorations, Klinger mentions personal items the characters have: Margaret has chintz curtains; Hawkeye and B.J. have their still; Charles has a red velvet pillow; and Colonel Potter has his saddle and a thumb painting. Clyde Kusatsu made a total of four guest appearances on M*A*S*H He played Kwang Duk in “Officers Only” and “Henry in Love” during Season 2, then came this episode, and finally he played Captain Yamato in “The Joker is Wild” during Season 11. Rizzo is mentioned but not seen. The Dumont TV network was the original home of Jackie Gleason via the “Calvacade of Stars” program which Gleason hosted beginning in 1950. “The Honeymooners” began it’s life as skits on the “Calvacade of Stars”. CBS eventually signed Gleason and moved his program to their network in 1952. The Honeymooners is probably the longest reaching legacy of the Dumont network (although the “classic episodes” aired on CBS in 1956, the characters and some of the sketches of the Honeymooners originated on Dumont TV). On a side note, Bruce Dumont is the nephew of Dumont network founder Allen Dumont. Bruce has had a long career in radio in the Chicago area. Bruce is also founder and CEO of the Museum of Broadcast Communications (also based in the windy city). The MBC houses the Radio Hall of Fame and inducts a new class of radio personalities each year. Jackie Gleason started “THE HONEYMOONERS” on THE CALVACADE OF STARS in 10/52 with Pert Kelton as Alice. When the show moved to CBS she was replaced by Audrey Meadows because she was blacklisted, they said she had a heart attack to cover it up. Art Carney played a cop in the first sketch, before Ed Norton was introduced a few sketches later with Elaine Stritch as Trixie. After that sketch though Jackie (who was also the “boss” of the whole show) decided he didn’t like her so he replaced her with Joyce Randolph. Klinger’s “Oh golly whiz yes!” when impersonating Radar near the end always cracks me up. Not a bad episode, though everyone making fun of Klinger’s decorations came off too mean-spirited for my taste. Maybe they were a bit mean but it didn’t make much sense that Klinger wouldn’t have sent this stuff from home when he still lived his on tent. He was one of the only people who had a tent to himself and he didn’t seem to care about decorating it with hookahs and Persian rugs. It seems that a bit of explanation about why he wanted these things but either have helped. Can’t have all been about the discharge thing again could it? I agree the teasing was too hard on Klinger, but his nasally impersonation of Colonel Potter always gets me. I agree that Yee’s story was way too rushed. Otherwise, this was a pretty solid episode. True, everyone was a bit rough on Klinger in this episode. On the other hand, if common sense applies this entire plotline goes out the window. While everyone else does have “non-GI” items, they all have private living quarters; once Klinger became “company cluck” he essentially lives in a corner of the duty hut. An analogy would be the difference in having your own office in a corporation and being the receptionist at the front desk. Yee’s story deserved more exploration, particularly the aftermath. And it underscores the lack of foresight in the military at the time. I’m surprised the review failed to mention that right after Hawkeye is informed of Sgt. Yee’s suicide attempt, the camera was out of position and it swung to its left. BJ (reading Klinger’s “forged” letter): It is,with a heavy heart, that I give my official okey-dokey to this lad’s adios. Sincerely, Sherman T. Potter. P.S. Please forgive the tearstains on this parchment. A really funny line from a funny/serious episode. I’m convinced that when Potter first enters Klinger’s refurbished office, he begins saying “Radar, where is the…”. Wonder if it was an actor’s mistake the editors missed it? Klinger’s stuff was indeed tacky. Maybe the others were mean to him, but they had a point.One or two items might have been all right, but what happened if they had official visitors? It wasn’t just Klinger’s place, it was the front office and the first thing people saw when they came to see Colonel Potter. And how did he get all that stuff to Korea and where did he keep it beforehand, anyway? This was one of the last times that Klinger tried to scam his way out of the Army. He does a pretty good impression of Colonel Potter’s style in the letter, but wouldn’t somebody at HQ have tried to confirm it with Potter? The Yee story might have worked better with a follow-up, as we never got to see what happened to him; after all Sydney himself admitted that his treatment was only a temporary solution. Yes and Klinger said his mom sent him stuff from his room. Are we to believe a 50 year old man still lives with his mother? I laughed in a previous episode when he said he was 30. Maybe born in 30. Asian countries have been at war with each other for as many centuries as the Western world. Yes is a Chinese surname and their history has as much internal fighting as external. I think this episode represents an early 80’s attempt by white Hollywood to earnestly connect with minorities and while failing miserably.